Growing up in the Catholic church made me familiar with the Gospels, Parables, and various miracles that Jesus performed, but I was unaware of some basic Bible stories that most people learned while they were in preschool. One of those stories is the adventure of Jonah. I remember when I was in seventh grade at youth group and my friends were talking about Jonah. I would laugh along and talk as if I knew what they were talking about, but in reality, I had no idea. As I continued growing in my knowledge of the Bible, I still always thought of Jonah as the “cute little Bible story man, who fled his calling, but eventually did what God wanted him to do.” However, I recently learned that there is much, MUCH more to the book of Jonah than I originally thought. Let’s dive in together! Right away in chapter one we see what the Lord called Jonah to do. God said, “Go to Nineveh, call out their evil!” Jonah thought the Ninevites were too evil and unworthy to receive a chance for repentance, so he took matters into his own hands and fled from what God had called him to do. While on the run, Jonah steps on a ship with pagan sailors. A huge storm hits, and the sailors wake Jonah up and tell him to pray to his God that the storm will cease. Lots are cast and it is found out that Jonah was the one causing the storm and he insists that he be thrown overboard. On the surface, this seems like a seemingly selfless act, but if we really think about what Jonah was attempting to accomplish, we see that this was an incredibly selfish thing to do. In his attempt to resist going to the wicked place of Nineveh, he tried to plot his own demise. Surely being thrown overboard would cause him to die, thus effectively ending his mission. However, God had other plans and Jonah was swallowed up by a fish that later vomited Jonah out. Once Jonah was vomited onto dry land, he FINALLY went to Nineveh. However, he didn’t go joyfully. The Bible tells us that Nineveh was an “exceedingly great city, three days journey breadth,” (Jonah 3:3). After about a day’s journey, Jonah stops, shouts out one sentence, “Yet forty days journey, and Nineveh will be overturned!” (3:4). After that one sentence sermon, the people of Nineveh, all the way up to the king, repented and God forgave them. In the first verse of chapter 4, we see that this repentance and forgiveness “displeased Jonah exceedingly, and he was very angry.” Later, Jonah tells God that he originally ran because he knew that if Nineveh heard the message God had for them, they would repent, and God would forgive them. Jonah did not want this to happen. The book closes with God questioning Jonah about His willingness to forgive those who are seen as His enemies. We get to see a glimpse of God’s heart to forgive. We don’t know if Jonah relented in his anger toward Nineveh or toward God. This book leaves us modern day readers questioning if we are accepting of God’s desire to see His enemies repent and turn to Him, or if we would rather act like Jonah and see them unforgiven and destroyed. Have you ever thought that your plan may be better than God’s? Our instinct may be to say no, but I think we can all see ourselves in Jonah here. There are times God calls us to do something that we just don’t want to do. 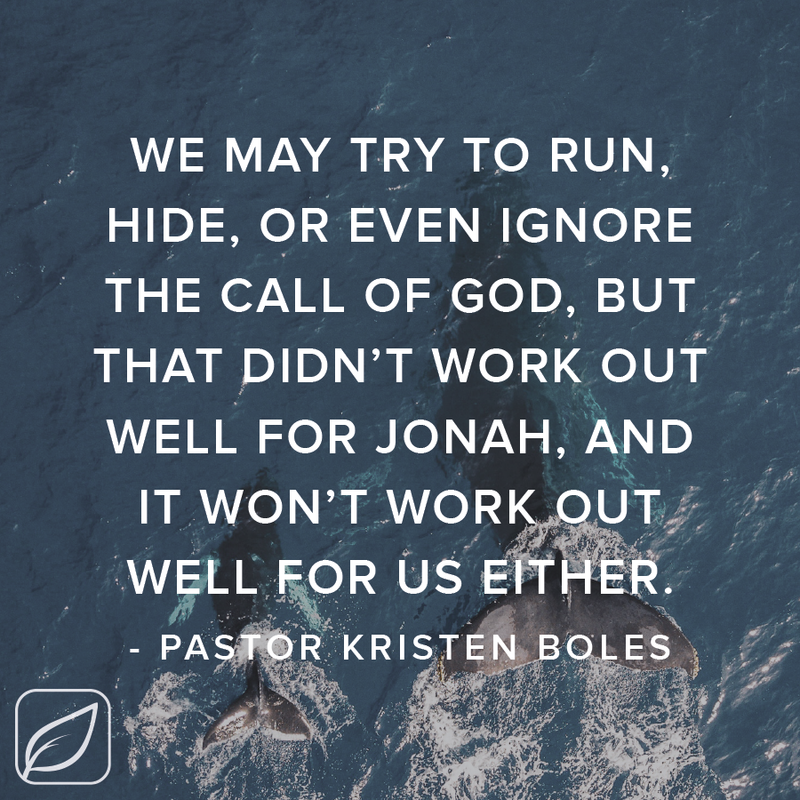 We may try to run, hide, or even ignore the call of God, but that didn’t work out well for Jonah and it won’t work out well for us either. Jonah was selfish and didn’t want his enemies to be saved. I pray that our hearts are never hardened like Jonah’s but are instead soft like God’s heart, desiring even the most wicked enemy to repent and receive forgiveness. If I could wrap the book of Jonah up in a few words, I would say it’s a book that lays out how Christians should NOT act and gives us an example to NOT follow. Let’s learn from Jonah, and go where God wants us to go, do what God wants us to do and preach to who God wants us to preach to, even if it is our earthly enemies!